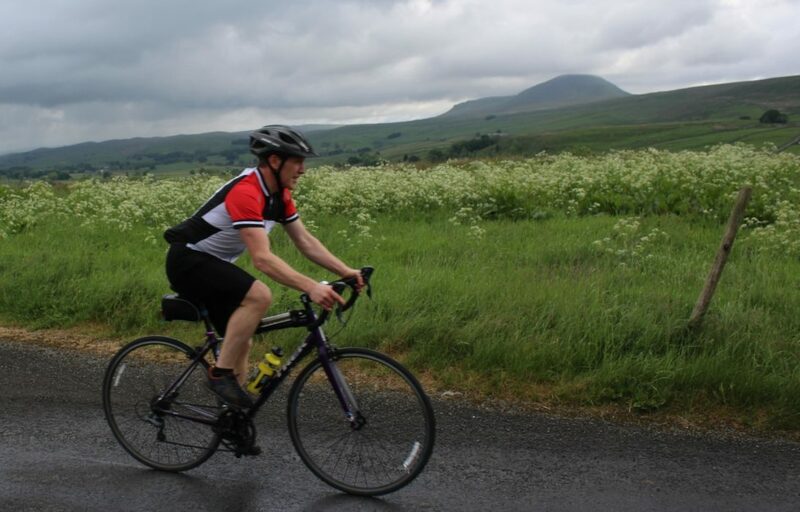 Carl McKeating set out to cycle The Way of the Roses, a 170-mile national cycle route most commonly ridden over three days, in a day. 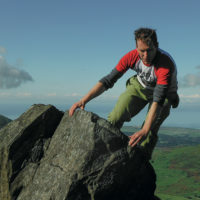 He describes the personal challenge, the brilliance of the route and the value of having a good family support team (Cicerone’s Way of the Roses author, Rachel Crolla, and the couple’s two young children). Standing ceremonially for a Grand Départ photo beside the Way of the Roses starting board on Morecambe seafront, I marvelled at the blue cycling sign above my head: ‘Bridlington 170 miles’ it read. It was 5.45am. Rachel, whose work on a Cicerone guide to the Way of the Roses had inspired me to attempt this, was taking the photo. In my arms I held our chirpy two-year-old daughter. Our eldest was asleep in the car. Along with Rachel, they were to be my support team. 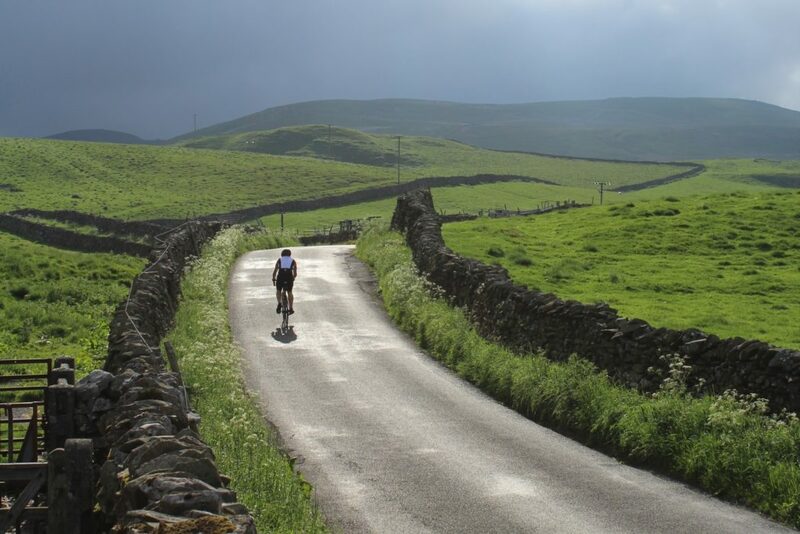 The Way of the Roses is a national cycling route formed by a 170-mile ribbon of minor roads and cycle paths that stretches from the Irish Sea in the west to the North Sea in the east (or vice versa) and unfurls an array of awe-inspiring landscapes. Normally cycled from west to east, the Way of the Roses starts in the Lancashire seaside resort of Morecambe and ends in the Yorkshire seaside resort of Bridlington. The ride is perfectly routed, delightfully balanced and stunning throughout. 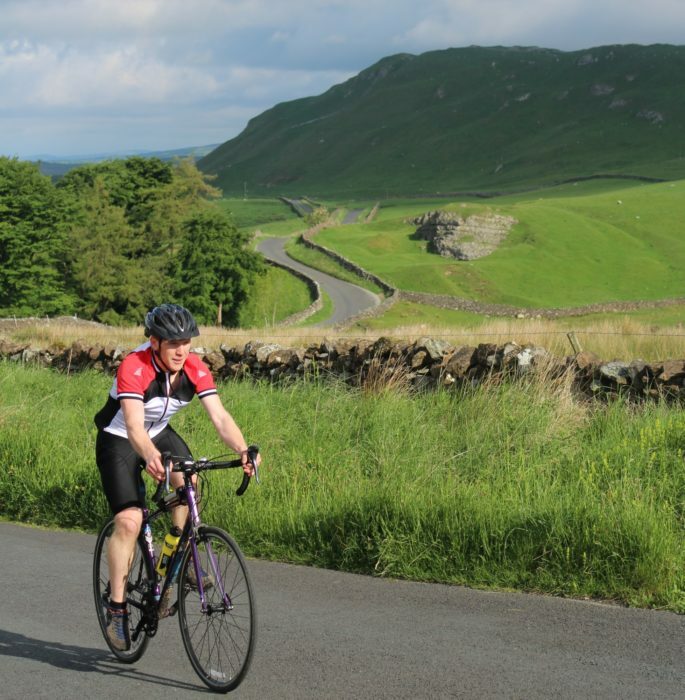 In between, many challenges and delights await; few who have attempted the route – regardless of over how many days – will forget the Yorkshire Dales hill climb out of Settle that somehow conspires to steepen to a point of feeling like it’s overhanging! 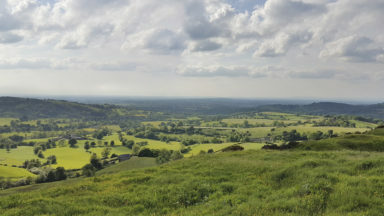 Neither will they forget scenic riches that include the Crook o’ Lune, the mountains of Ingleborough and Pen-y-Ghent, Burnsall, Brimham Rocks, Studley Royal, the Devil’s Arrows at Boroughbridge, Benningborough Hall, York Minster and the picturesque chalk wold of Millington Woods – to name but a few. Likewise, there is something pleasing in connecting the ancient county towns of Lancaster and York by following signage that uses two royal roses – one red, one white. 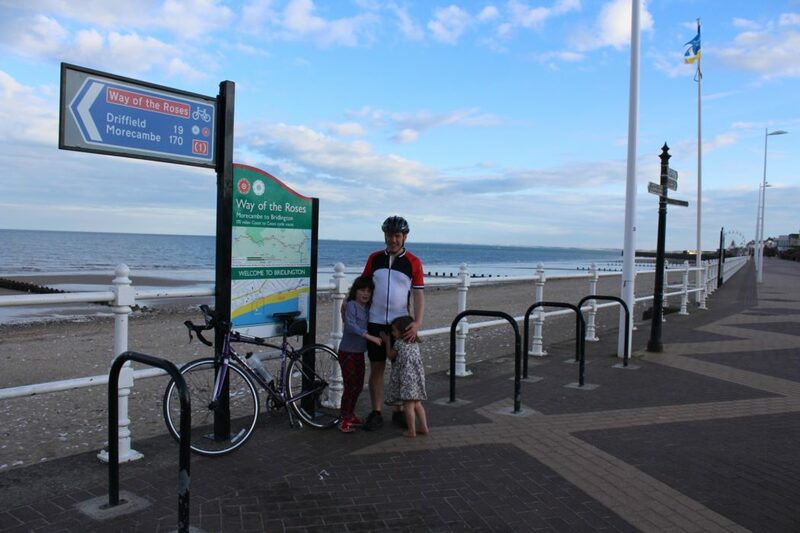 The ‘Bridlington 170 miles’ on the sign should have been a moment for a last-minute wobble. After all, I am very much an occasional cyclist; I don’t own a pair of cycling shoes, I don’t wear cycling glasses and, although I have recently succumbed to the handiness and comfort of wearing padded cycling shorts and cycling jerseys with back pockets, I cannot claim to be a fully paid-up member of the Lycra-clad warriors who routinely glide along our lanes and byways and for whom day rides that clock up 100 miles-plus are standard fare. No, I belong to the ‘that’ll be fun’ occasional bike tour brigade. The type you’ll see making their way slowly along such touring routes as the C2C with rucksacks on their backs or who might, 20 years earlier in their youth, have had a stupid idea such as attempting to cycle to Egypt on a three-quarter sized kids bike while carrying about three tonnes of equipment… So, for me attempting the Way in a Day was never a question of How fast? or In what style? Instead, it was that purest great unknown of any good challenge we set ourselves in life – Could I really do this?. 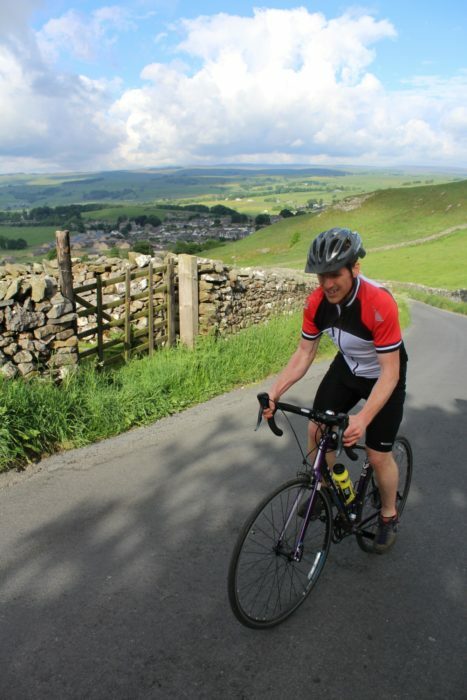 I had done the Way of the Roses over two days the year before, so I knew how tough the route is – especially its hilly passage through Lancashire, the Yorkshire Dales and Nidderdale. There is a total of 2500m of ascent across its course. Still, I like a good challenge. The Way in a Day was definitely going to be just that. I grew up watching the Rocky films and have always identified with how Rocky’s underdog capacity to keep going makes up for a significant dearth of skill. I had expected a couple of weeks more training and had not in any way recovered from the one really big training ride I had done to date (incidentally on the good but, in my opinion, inferior C2C national cycling route two days earlier). 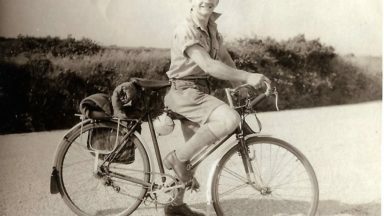 I had managed only 1½ hours sleep and at 3am, before leaving the house, had sat at a computer screen dismayed to see the Met Office predicting rain and even thunderstorms at nearly every point of my anticipated ride. Rachel was a steadying influence on my 3am weather doubts. Full of optimism, she said: ‘Oh that weather could go either way, this is the British summer.’ And she was right. As I pushed off from Morecambe seafront the morning light was driving out the last of the night’s shady remnants, while patches of blue peeped between scudding clouds and offered hope that the recent downpours that had drenched all the roads and pavements might hold off long enough to allow me a dry start. I pedalled as fast as I could, keen to make it to Bridlington before it got dark and ideally before all the fish and chip shops closed. 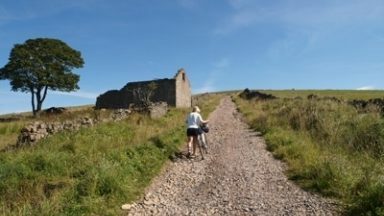 The start along the Lune cycle path follows part of an abandoned railway line that had connected Lancaster to Ingleton. It normally feels easy. 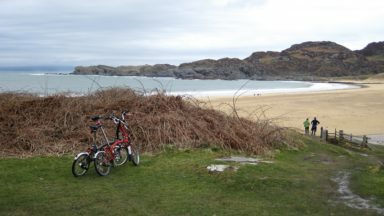 Today it felt hard – somehow I had a light headwind rather than the south-westerly tailwind I had expected. Still, bunnies hopped in and out of view and a fox that darted in front of my wheels reminded me just how much the silence and speed of bicycle travel allows for surprise encounters with our native wildlife. At the Crook o’ Lune I saw Rachel again. Both our daughters were awake now. 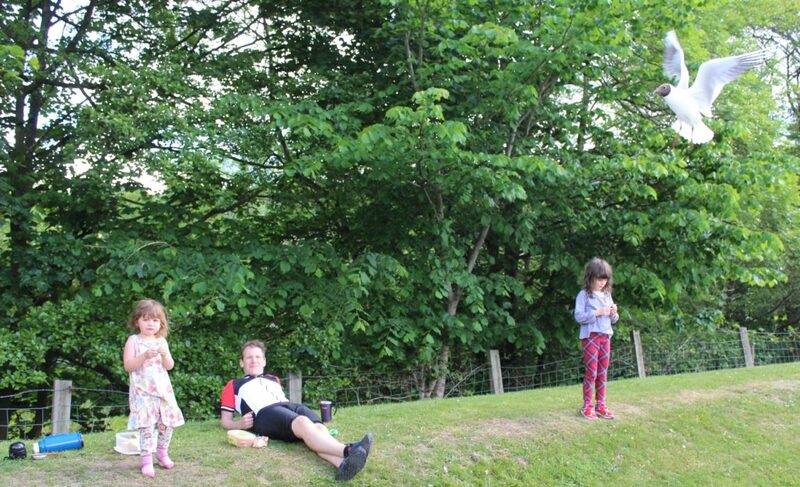 With shouts of ‘Go on Daddy, you can do it!’ still ringing in my ears, the steep hill climb from Halton to the Lancashire tops went well (although having borrowed Rachel’s lighter bicycle undoubtedly helped). My pedals zipping through their circles and high above the deep blue of the River Lune meandering its way through rich green pastures, I was bathed in the glorious golden-whites of early morning sunshine. Ingleborough, one of the highest peaks in Yorkshire, glowed majestic and ethereal in the watery distance. ‘This ride is awesome,’ I thought to myself. After crossing the Lune again at Hornby, light rain began to fall. Momentum was with me now, however, and it did little to dampen my spirits. Soon I passed from Lancashire into my home county of Yorkshire. Although only 19 miles had been covered, it felt like significant progress. 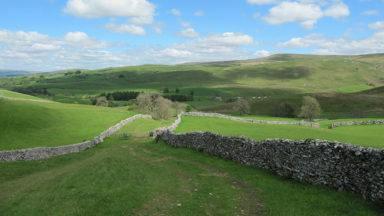 By the time I stopped to quaff down a cup of tea beyond Austwick, amid the limestone walls of Yorkshire Dales postcard territory, the rain had cleared and all was dry. Powering on, Pen-y-Ghent with its steep dark faces flashed by on my left. 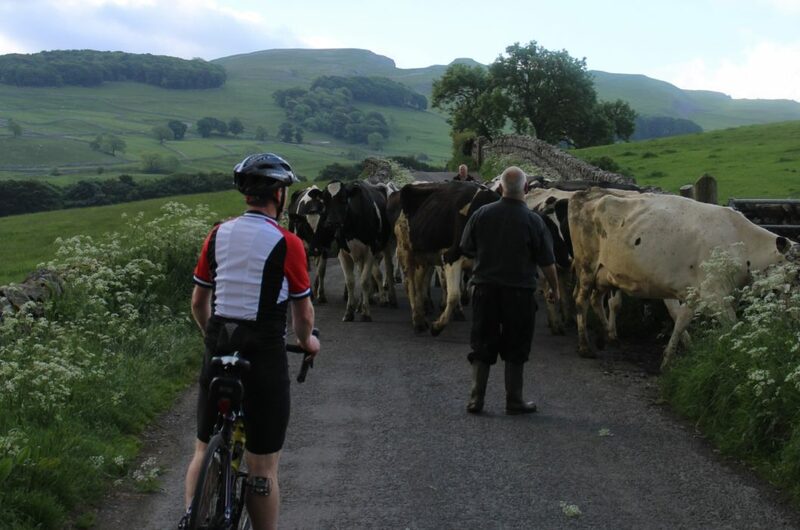 Then just before Settle a road full of cows forced a few minutes stoppage. As the cows were herded into a field I chatted to a farmer about the ride and marvelled that, but for my support team, which we had agreed would meet me at preordained places, I had not seen a single car on the route so far. 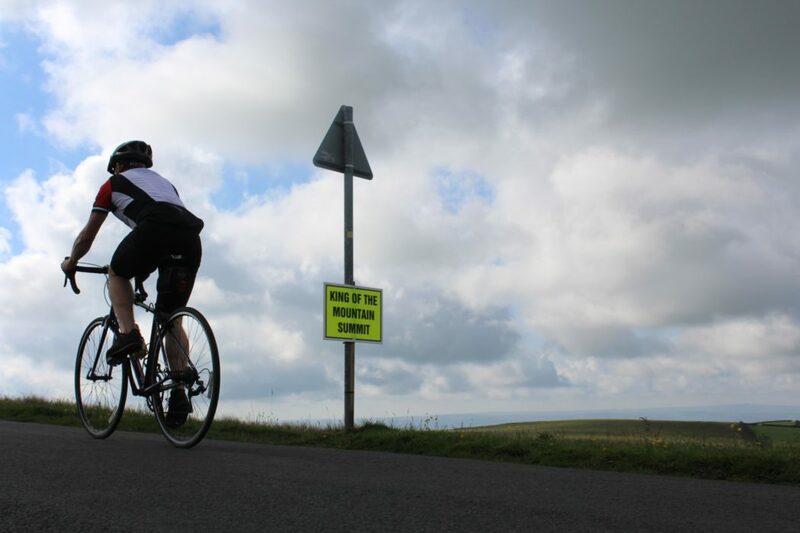 For all its brutal challenge, High Hill Lane is one of the highlights of the route. 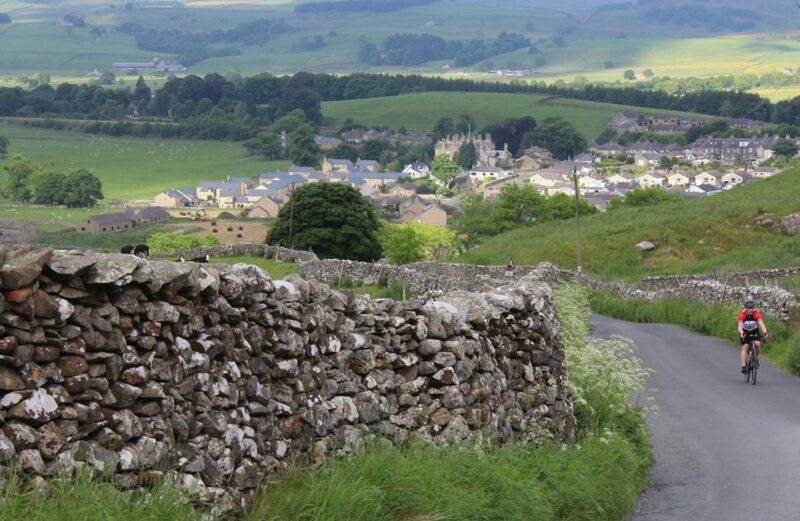 There’s such a tremendous satisfaction when you eventually top-out and commence the effortless soaring glide down to Airton, a huge swathe of the Yorkshire Dales now displayed before you. Rachel somehow missed me at the beautiful village of Burnsall. 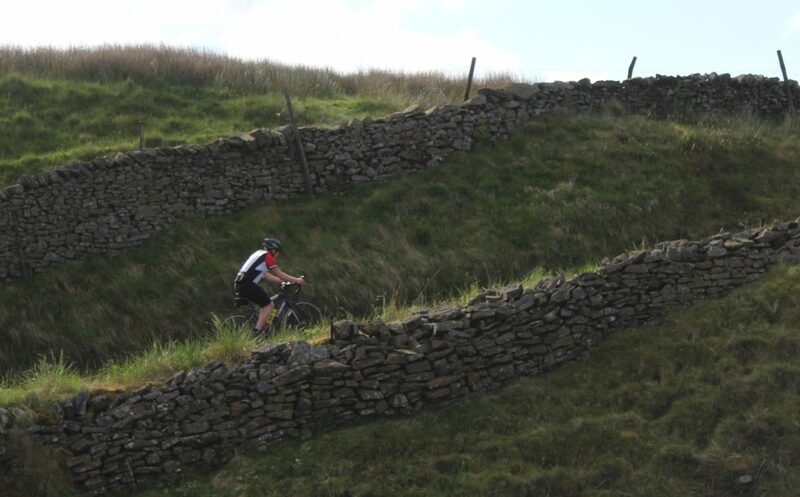 This was not good; I had forgotten to pocket some food and had banked on eating something to fuel the monster climb up from the River Wharfe to Greenhow – the high point of the route. To my relief my support team found me again at Greenhow and I dismounted for lunch in Pateley Bridge after 64 miles in the saddle. 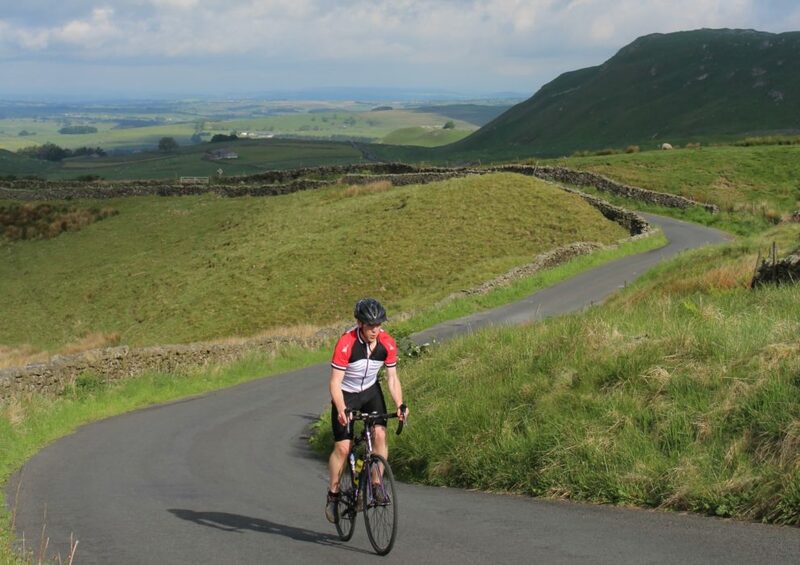 Although happy to have safely negotiated the incredibly fast descent from Greenhow (it requires considerable care), by the time I got off the bike I was having a massive blood sugar crash – an experience I’ve heard about but never before experienced. Hurriedly eating a chocolate bar, I felt my body – reignited by sugar – rally from what seemed an imminent and quite frightening complete shutdown to an almost electrically charged restart. I now looked at a clock for the first time since leaving Morecambe and was shocked; I was an hour faster than I had anticipated. This discovery, added to a good long lunch eaten while our daughters fed bits of crusts to seagulls, made me feel tremendous. 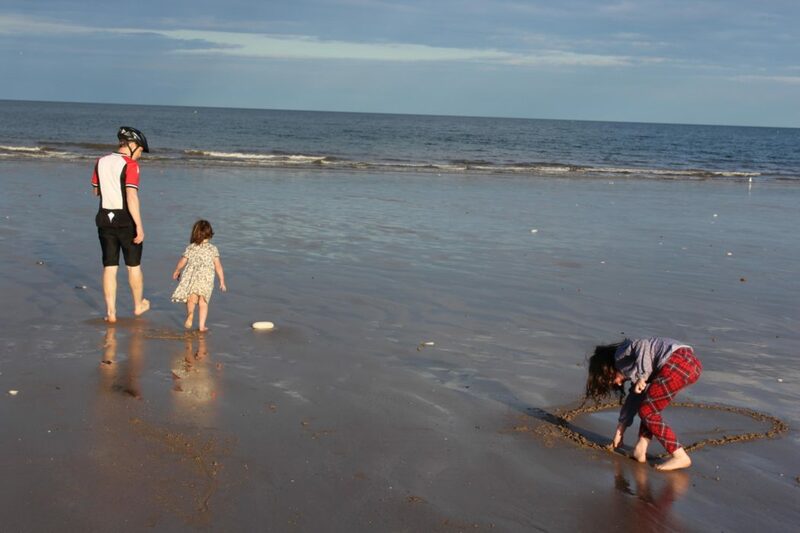 The weather also helped; it was now a perfect summer’s day. The climb to the famous Brimham Rocks – the last really beastly climb of the route – felt enjoyable. When I had done the ride over two days, Brimham had been the end of day one. While there are just over 100 miles to go after Brimham, it very much feels like the halfway point of the ride because all the brutal hills have been overcome. Full of enthusiasm, I sped eastwards. My support team appeared here and there. I saw them at a playground beside the route in Ripon and stopped for a cuppa with them at Beningborough Hall. The route then passes directly through York, mostly on purpose-built cycle paths. Incredibly, these pop you up at York Minster, but otherwise carry you efficiently through the city without having to contend with any significant traffic or clutter. In the afternoon Rachel and the kids visited the Yorkshire Museum of Farming – which is also on the route. I just kept rolling east. It is quite difficult to eat when you’re pushing hard on a bike. I’m distrustful of those energy gels people sometimes use, so while on the bike I ate five apples, two bananas and half a Mars Bar. At stops I chomped a few biscuits, a chocolate bar, a bowl of Shredded Wheat with milk and a third of a Cornish pasty, but could not touch the peanut butter sandwiches I had expected to be eating. It was only at about 4.40pm in Pocklington, when I managed to eat a quality sausage roll, that I finally had some substantial stodge in the burner. After Pocklington the route leads through the amazing Millington Woods with its chalk wold. There was not a soul in sight as I made my way up. Therefore, no one else witnessed the red deer that ran along the road only a couple of metres in front of me. It seemed to stay just ahead for an eternity before finally jumping over a fence and prancing off. 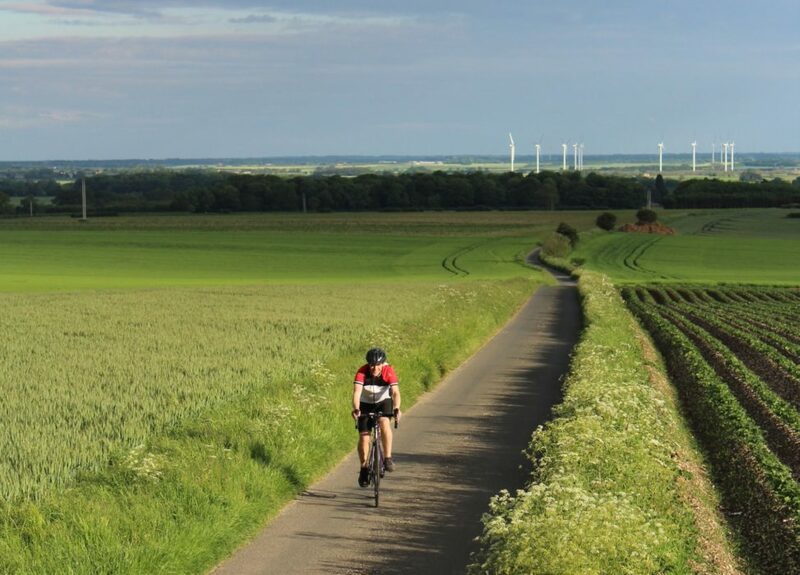 Soon after Huggate I got my first glimpses of the North Sea and, feeling the wind in my sails, happily flew along linking ancient farming villages, rolling hills and open fields of crops. My support team joined me again at Burn Butts Farm just after Kirkham. It was great to see them. Only 26 miles or so of steady terrain remained. ‘How do you feel?’ Rachel asked. ‘Really good, I’m really enjoying it. My knee is aching a bit, so I’m not going to hammer it, but otherwise great,’ I replied. I shared out the bakery delights I had bought for everyone in Pocklington – picture very happy children – wolfed down a slice of marmalade cake, quaffed yet another cup of tea and pressed on. As I approached the Way of the Roses finishing board, I could see my two daughters and Rachel waving and cheering in the brilliant evening sunshine. It was 7.40pm. 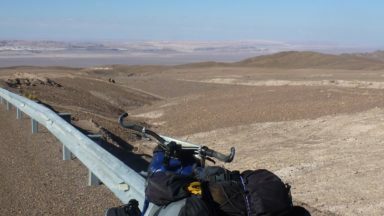 By now my body was meant to feel physically destroyed by the ride – but much to my surprise I felt brilliant. Having two children calling me ‘Hero Daddy’ undoubtedly helped ward off any creeping fatigue. We all wandered down to the sea. I had a good paddle with the kids, who were excited and hopefully will be inspired by my ride. All that remained was to enjoy a fish and chip supper and get back home. Managing to do the Way in a Day was a big achievement for me, but it would not have mattered if I had not completed it. After all, having a go at these things is what it is all about and any cycling, regardless of distance and duration, along The Way of the Roses route is a worthwhile pursuit in itself.